Among all the precious gems of the world, the most breathtaking are flowers. In contrast to the near indestructible gems of the earth (“Diamonds are forever”) flowers often see new life and death with the rising and setting sun, but they are seldom less capable of enrapturing the human heart. In further contrast to scarce gems of the earth, flowers quite literally grow on trees, and, in the case of dahlias, from tubers. A limitess fountain of some of the worlds most bedazzling explosions of color, wrapped in the most drab, affordable, little bundles of dirt, what woman wouldn’t want a diamond mine in the palm of her hand? Similarly, what woman would not want a dahlia tuber? All it takes is a bite from ‘the bug’ to initiate the disease. But once contracted, Dahlia Fever is hardly discernable from the symptoms of diamonds, gold, pearls. The difference (and danger) is you can fit far more purchases on your credit card, and need the space and skills to grow the annual magnum opus of flowers. 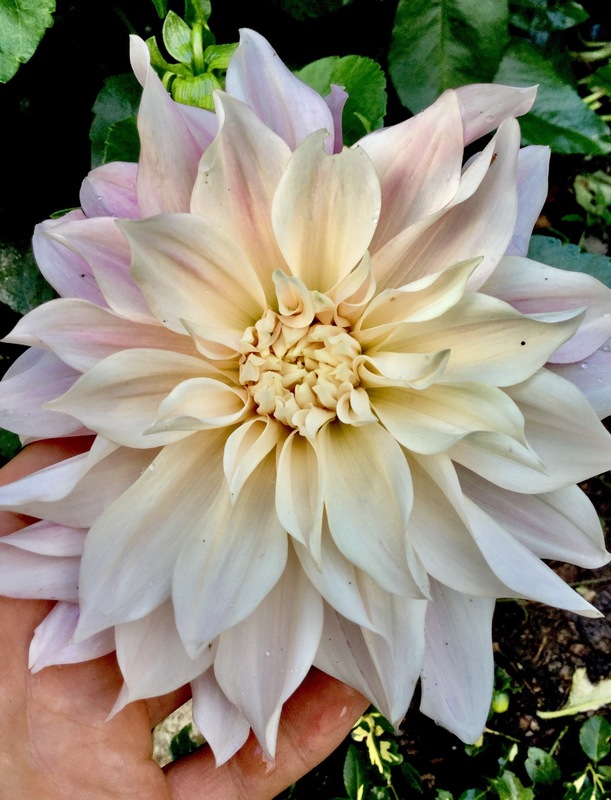 Currently I am associated with two infected specimen -my mother and neighbor – and one man who has for decades carried on his late mother’s heirloom dahlia. He isn’t enthralled with the flowers, he raises them for the sake of his mother’s memory -the flower literally meant that much to her -and she that much to him. Watching my mother and my neighbor, it’s not hard to imagine why. Whether the early hours of the morning, or the late hours of the night, they’ll be in their patches with flashlights, peering into the opening buds for fear they will blast open behind their backs. Every one is scrutinized for its lineage, and worth. Between the two of them, there are about eighty clumps of tubers, and fifty varieties, which must be dug annually (dahlias cannot freeze, so must be dug up and stored indoors in our climate.). 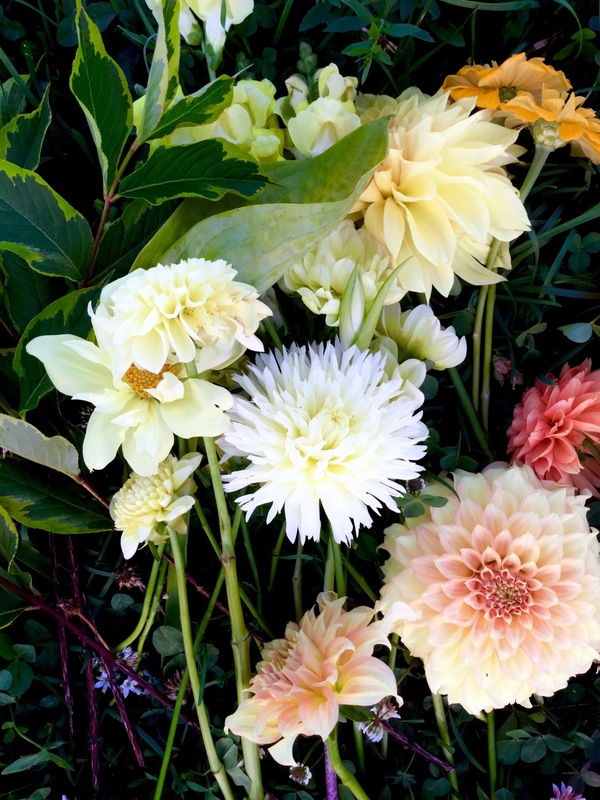 Both the fall digging, and the spring replanting, and later in the summer the other nuances of dahlia care, including arranging all those gems of flowers for sale, is done by yours truly. As they ran off to admire their pile of pretty posies, I read of the more practical aspects of the plant. I found out dahlias come from the mountainous, volcanic soils of South America. They were originally brought to the old world as an exotic edible. The frenzy for flowers came later. So my question is, as I’m watching the two women oggling over the yearly harvest of tubers -dahlias, dahlias everywhere -are they any good to eat? I wouldn’t dare touch one of the little diamond mines for fear of my life. But the one heirloom dahlia kept by the elderly man I mentioned, he has shared with us. It is just short of indestructible. It would grow on concrete if you let it, and multiplies like crazy, unlike many of the other more expensive, rare, and “precious” specimens. In their careful inspection of varieties, the two women will regularly toss these abundant survivors over their backs to the reject pile, so I grabbed a couple to plant in the food forest, and grow on for eating. I grew it in a new bed. This ensured it would have the fertility necessary to make good tubers. I did nothing with it otherwise. I didn’t even pick the flowers off, despite my mothers disapproval. A branch broke off in a windstorm, but otherwise, it had all the energy it could get to make more tubers. That’s so lovely. I too have become enraptured by flowers of many kinds and now can’t have enough of them! The great thing is that so many of them adorn unlikely and rather unprepossessing vegetables. I appreciate you pointing that out. Some flower designers were made famous for adding purple cabbage leaves to their bouquets. Vegetables can be quite vogue! Cleverly written. I am publishing it to my site in January. Thank you. Thank you! I hope look forward to seeing your reader’s response.